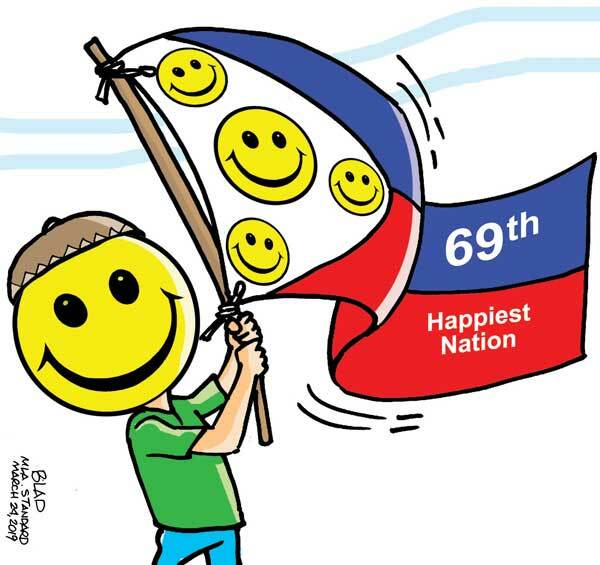 The Philippines, which can rival Thailand as the “land of smiles” anywhere in Asia and beyond, has been identified in a United Nations report this week as the 69th happiest of 156 countries thus ranked. Many are likely to feel deep pleasure, and may even jab the air with proud fists at being in a country that has moved up two places from 2018 or 71st in that year’s notch. The Philippines, with 106 million population across much of the 7,107 islands at low tide between the Pacific and the South China Sea, definitely comparatively a bigger country than Finland, which has 5.56 million in 2019, and ranks 115th in the world, and reported as the happiest in 2019. The Philippines has been ranked higher than its fellow members in the Association of Southeast Asian Nations, a largely economic alliance founded in 1967, like Malaysia (80th), Indonesia (92nd), Vietnam (94th), Laos (105th), Cambodia (109th), and Myanmar (131st). The World Happiness Report 2019 used survey data asking citizens from the different continents how happy they perceive themselves to be, which included other calculators or dimensions like life expectancy, income and social support. We are no party poopers. But like others, we are persuaded to come down on the methodology of the study and question its conclusions. We are persuaded by the thoughts of Finn Frank Martela, a researcher specializing in both the psychology and philosophy of well-being and meaning in life, who raised his argument that there are four ways to measure happiness, and depending on which one we choose, we get entirely completely different countries at the top of the ranking. Something indeed is more required than the argument that neither life satisfaction, positive emotions nor absence of depression can raise the level of happiness. Another study has suggested that a person has to experience one’s life as meaningful—whether people feel their life has an important purpose or meaning. In this study, done by Shigehiro Oisihi of the University of Virginia, and Ed Diner of the University of Illinois at Urbana-Champaign, Finland and the United States were far behind. It is by definition, Juan, that happiness is about quiet satisfaction with one’s life conditions.